At work this week a coworker came in and asked us if we could do him a favor. 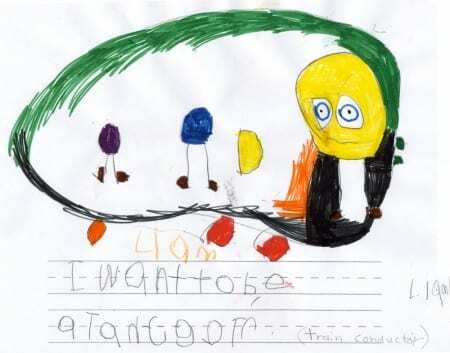 His daughter’s 2nd grade class had each drawn pictures of what they wanted to be when they grew up. He wanted to know if we could scan each drawing for him. Which we did, and had a bit of amusement while doing it. There were the normal jobs that one can imagine gets chosen in these situations: doctors, firemen, police officers. Some kids wanted to be farmers, even a basketball player. My coworker’s daughter wanted to be an artist. One of her friends wanted to be a “flower picker.” But good old Liam here, he wanted to be a Tan Cgotr. 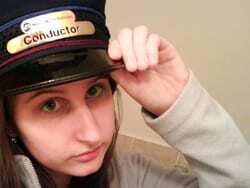 Which, thanks to the teacher, translates to Train Conductor. From the looks of the drawing, this future Metro-North conductor will probably be on that last late-night train out of Grand Central. You know which one I mean, the one that runs local all the way down the Harlem Line, and has plenty of drunks. It looks like Liam here plans on drinking lots of caffeine to keep awake, so much that his eyes are practically popping out of his head. I’m not exactly sure if this is supposed to be a big window on an m7 or something, or the picture is supposed to be the actual train (are those wheels at the bottom?). 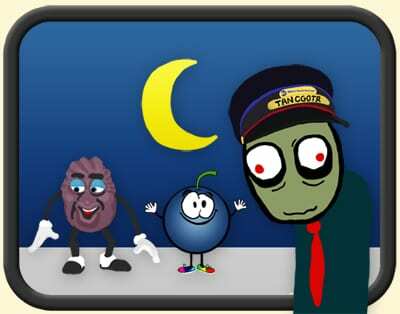 But apparently Liam imagines serving all the California Raisins and Blueberry people that ride Metro-North. Drunk or high “artist’s” alternate rendition of Liam’s drawing, starring Salad Fingers. Anyways, I thank Liam for his wonderful drawing. I would be most happy to purchase Liam’s next child’s fare on Metro North. Perhaps I can introduce him to some cool tan cgotrs. This is just freakin’ hilarious! Thanks for the good laugh!